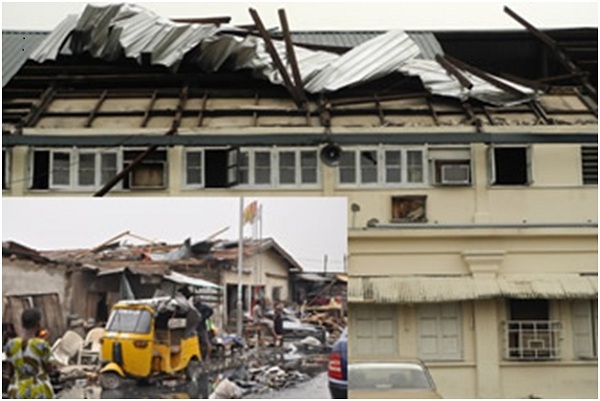 A storm occurred in Nigeria’s main commercial city, Lagos, on Monday, tearing homes and properties apart, causing tens of hundreds of damages, both to the government and the people. That kind of storm has not been experienced in Lagos of late and was in a different class from the series of deluge in the city last year. The government is usually been blamed at instances of flood and erosion, for poor infrastructural setup. The storm, however, swung blames elsewhere, with property owners shown their flaws, as their sub-managed properties were damaged to their shame. Nigeria, with two weather seasons, dry and wet, is yet to go from the dry season to the wet one, that roughly starts from March, experienced a powerful storm. “If this occurred now, what will, when rain starts” asked by many after the storm, forecasts will tell, but the storm is a happenchance that should spur preparations. The storm has also being linked to global warming, according to some people that believes that any weather deviation of late is tied to that. Global warming? possibly, but it may just be a coincidence. Climate change is the moniker for most weather anomalies occurring for some decades, in line with global warming, when climate change or changing climate can also be a name for a weather deviation or interlude before a new weather season. There are several weather deviations around the world recently, blizzards, avalanche, deluge, rainstorms and drought. These deviations coincides with the heightened news of global warming, occurring because of Green House Emissions – from burning of fossil fuels – piling in the atmosphere and trapping more heat to the earth. Some of those deviations could be as a result of global warming, others may not. Climatic science will explain. Global warming or the current climate coincidence is not Nigeria’s primary concern, what is, is adaptation. How will the country save itself from the embarrassment of weather tweaks? Flood when it happens in Nigeria is a problem, erosion too, same, storm is obviously one now, and the list of others with their damages are rife. Nigeria has so much to attend to concerning development and may not focus on climate change adaptation leaving the rest to trail. The government, for balanced development, should prioritize adaptation. There are efforts at hand, but the shock of Monday, show glitches that could class subsequent storms in magnitude of higher devastation. Lives may continue to be lost, irreparable damages may come and work in progress may be stalled, if things are not done fast. Little as detailed announcement may sound, it helps, forewarning people and giving safety tips does too, directing property owners to ensure routine maintenance, matters, and applying simple sustainable solutions to flood and erosion problems because of budget constraints is necessary. Flood in Lagos is pain, and erosion in South-Eastern Nigeria clogs, ignoring these issues by assuming that people are used to it, is immolation. Getting started with action in this dry season is needful to buffer the situation when rain peaks during the wet season. The Lagos flood issue is mostly a problem of development, channels and thru ways may be too expensive if accumulated as government project, but solutions are needed and it should come from the government. The government may write to organizations in an area or a body of all of them, or to neighborhood associations, about its intent to solve their problem. The letter will contain a number of solutions, after government must have studied the situation properly, the final and lasting one may be slated for the next fiscal year or beyond, but a way to get the hood off its problem temporarily will be presented. Government may seek support from them in what will not be a direct exchange but some contributions to achieve the objective. The South-East Nigeria erosion problem is what can be solved if the government wants to, “it gets beyond hand” in some cases, according to some of the local officials, but somehow, it really does not. That region has schools, and there have been submissions pointing to how government can help from simple to major solutions. If more simple ones are inputted in annual budgets and major ones are shared for different fiscal years, the region will close in on total solution. The decision lies with the government and how really they want the problem solved. Erosion, may never go but can be brought to an unaffectedly small state. Nigeria needs to help itself, losses of lives, time, resources and more are growing with undesired events. Climate change or whatsoever can be blamed, and top polluting nations can be condemned but when the events occur, it is Nigeria’s standing that tells how it fares. hmm, we need prayers in dis country.